Over the 2015 / 2016 New Zealand summer, now coming to a close, TAG Oil Ltd. has been home to engineering student Cody Brown, accounting student Sam Pearce, and geology students Henry Nagel and Nathan Murray. During the summer program, students have been fortunate enough to gain experience and insight into the operations that are undertaken at TAG. The students were exposed to projects that directly related to their chosen fields, including regular site visits, a Vause training day, the dreaded weekly boot camp, the Kapuni 3D seismic field trip, and the TAG field trip. Upon first arriving at TAG, the summer students were given a tour of the Cheal A production station, as well as Cheal B and E. For most of the students this was their first time at a site such as these, and it provided a big-picture view of the scale and workings of TAG’s operations. Thereafter, whenever a member of the TAG team traveled to one of the Cheal sites, the students were given the opportunity to go. Vause, a company located in New Plymouth, offers a range of oil and gas support services, from supporting well completion and hydraulic stimulation, to production, and intervention. Twice a week, a number of the TAG New Plymouth office team head to the local Rampage Fitness gym to take part in a 45-minute instructed boot camp. Full of burpees, press ups, running, circuits and more, boot camp provides a great bonding opportunity – and exercise – for the TAG team. The Kapuni 3D seismic field trip gave members of TAG’s geoscience team, including geology student Nathan Murray, a chance to see the Kapuni 3D seismic project being undertaken first-hand. The field trip gave significant insight into the project, the scope of the operations, and of the process involved in a seismic project of this scale. The TAG Field Trip was run by TAG’s Geoscience team and was designed to provide a learning opportunity for both the TAG team and the students. We visited coastal outcrops that provided a unique opportunity to examine the reservoir intervals that TAG produces at its Cheal and Sidewinder properties. Students were heavily involved in the day and cooked the team a BBQ lunch. As a result of this exposure, guidance and support of the deeply experienced team at TAG, the students have significantly broadened their knowledge, gained important skills to help with their studies and future career endeavors, and increased their understanding – and appreciation of – operating within a dynamic and challenging work environment. We enjoyed our time with the students, and hope that TAG’s summer student program has offered a unique learning opportunity and an invaluable experience for each individual within their chosen field of study. Thanks for your help and here’s to a rewarding future! 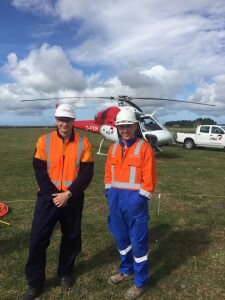 Left: Geology student Nathan Murray and geologist Ben Dowman take a look at the helicopter used to distribute seismic equipment and supplies for the Kapuni 3D seismic project. 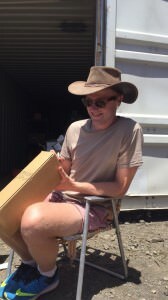 Center and right: Geology students Henry Nagel (pictured) and Nathan Murray undertook a project to reorganise and catalogue TAG’s collection of cuttings stored at Oil and Engineering Services Yard in Bell Block.